Fifty-four entries started the class in round one and nine advanced to the jump-off with four jumping double clear. Katie Dinan and Grant Road Partners’ Nougat du Vallet were the first pair to clear the short course and set the time to beat at 38.19 seconds in the jump-off, eventually finishing second. Ken Berkley and Ax-Cent, owned by Rivers Edge, also cleared the jump-off course and stopped the clock in 39.12 seconds to place fourth. Reed Kessler and Ligist were next to go and blazed through the course in 37.81 seconds to take the lead. Last on course, Brianne Goutal and Cloverleaf Farm’s Nice de Prissey cleared the short course in 38.53 seconds to secure fourth place honors. Second place finisher Katie Dinan was also very pleased with her mount Nougat du Vallet. Dinan, who is currently in college at Harvard University, is off from school for the month and making the most of her time in Wellington. Brianne Goutal went last with her mount Nice de Prissey and had the opportunity to see both riders go in the jump-off, but had to take into account her horse’s large stride. Garfield and Alexandra Crown jumped their way to championship honors in the Antares Large Junior Hunters 16-17 division during week two of competition at the FTI Consulting Winter Equestrian Festival (FTI WEF). Crown, of New York City, and her eleven-year-old Holsteiner gelding nearly swept the division after winning all four over fences classes. The pair placed fourth in a competitive under saddle class on day two of competition for the division. The reserve champion title went to Southfields Farm’s Bishonen and David Oberkircher. 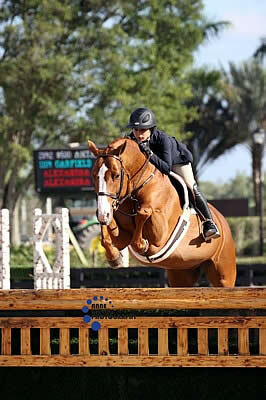 The eleven-year-old Warmblood gelding, trained by David Raposa, placed second over fences during day one of competition. Bishonen and Oberkircher took home the blue in the under saddle class on day two after earning fifth and third place ribbons in the over fences rounds. Crown and Garfield were also named Junior Owner/Rider Champion for earning the most points of any owner/rider combination in the division. Crown purchased Garfield in late 2011 after deciding to move up from the pony hunter divisions. “[Trainer] Scott Stewart had shown him for a year before me, so he knew he would be a perfect first year hunter for me,” Crown stated. Stewart was obviously on to something; Crown and Garfield competed up and down the east coast in 2012 before being named Large Junior Hunter 15 and Under Champion at the Pennsylvania National in Harrisburg, Pa. The pair had strong performances at the Hampton Classic, Capital Challenge, and Washington International horse shows as well. Garfield has been Crown’s beloved partner ever since their first show together. “He has such a big stride that he can cover up a lot of the small mistakes I made when I first got him. He’s such a good fit for me,” Crown stated. Crown was also complimentary of course designer Philip J. Devita’s course in the Rost Arena. “I really liked the course [on day two]. The long approach to the oxer let you have a good pace and go forward. So did the long bending line. I could go forward and his big stride helped with that,” Crown stated. Week two of competition at the FTI WEF, sponsored by Wellington Equestrian Realty, concludes Sunday. The Bainbridge Amateur-Owner Hunter 18-35 division will award championship honors in the E. R. Mische Grand Hunter Arena. 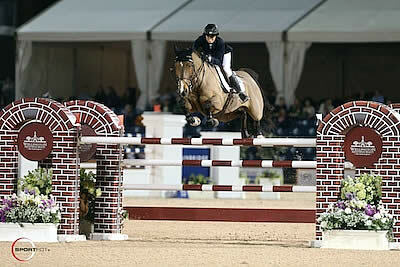 The $25,000 Suncast 1.50m Championship Jumper Classic will be held in the International Arena. For full results, go to www.showgroundslive.com.